2 Bedroom Maisonette For Sale in Torquay for Offers in excess of £105,000. A lovely, two double bedroom, maisonette just a short distance from Torquay town centre and having the benefit of residents permit parking. Included in the accommodation is a living room leading to a balcony, kitchen, bathroom, double glazing and central heating. From the balcony and main bedrooms there are views over the town centre to the sea and Living Coasts in the distance. Fitted with a range of matching wall, base and drawer units with work surfaces over incorporating a stainless steel sink unit with mixer tap, built in electric oven with hob and extractor hood over, spaces for washing machine, fridge and freezer, part tiled walls, tiled floor, boiler providing heating, double glazed window overlooking the rear. Double glazed window and double glazed door leading to the balcony with views over Torquay town centre to the sea and Living Coasts in the distance, electric fire with a mantel over, coving, radiator. 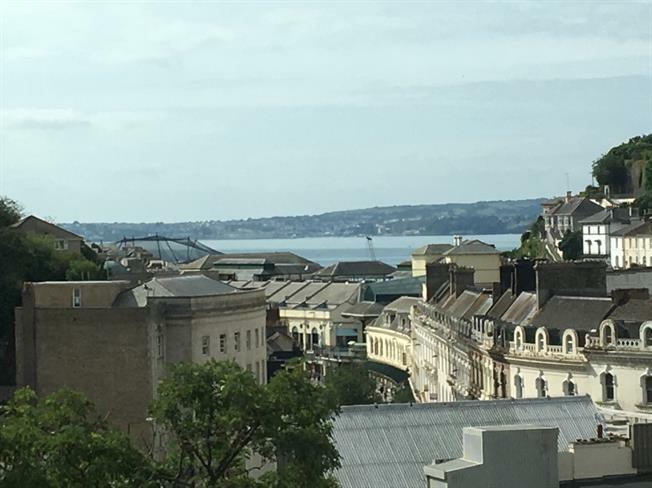 Iron balustrade and views over Torquay town centre to the sea and Living Coasts in the distance. Double glazed window overlooking Torquay town centre to the sea and Living Coasts in the distance, radiator. Double glazed tilt and turn window, radiator. Fitted with a panelled bath with electric shower over, low level flush WC, pedestal wash hand basin, obscure tilt and turn window, part tiled walls, boiler providing hot water, radiator.